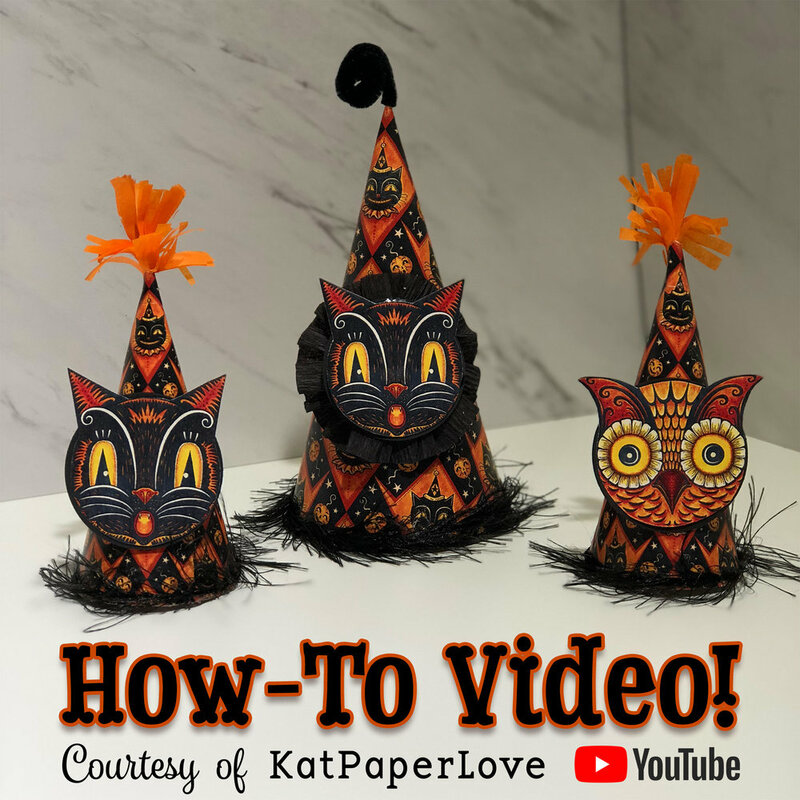 How - To Halloween Hats! 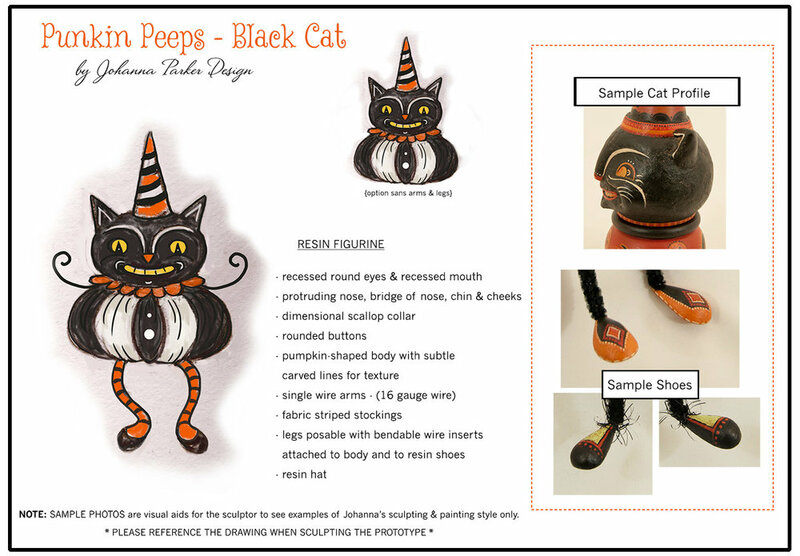 NOTE: Abby used a clever combination of both our FREE Print & Share Cat & Owl faces as well as our new “Black Cat & Jacks Halloween Hat” design, available in our Store. The results are clearly spooktacular! We hope you watch and are inspired to try some for yourself! 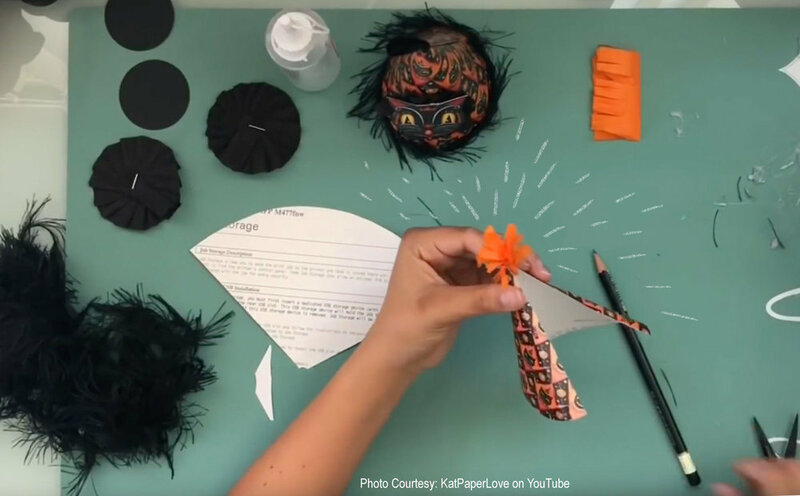 Watch & Learn HOW TO make these Vintage Halloween Hats on Abby’s KatPaperLove YouTube channel! It all starts with printing our high res digital download and cutting it up from there! Once you purchase the file, you can print as many as you wish for personal use. Once she finished the hat, Abby added my freebie cat to embellish the look! Voila! 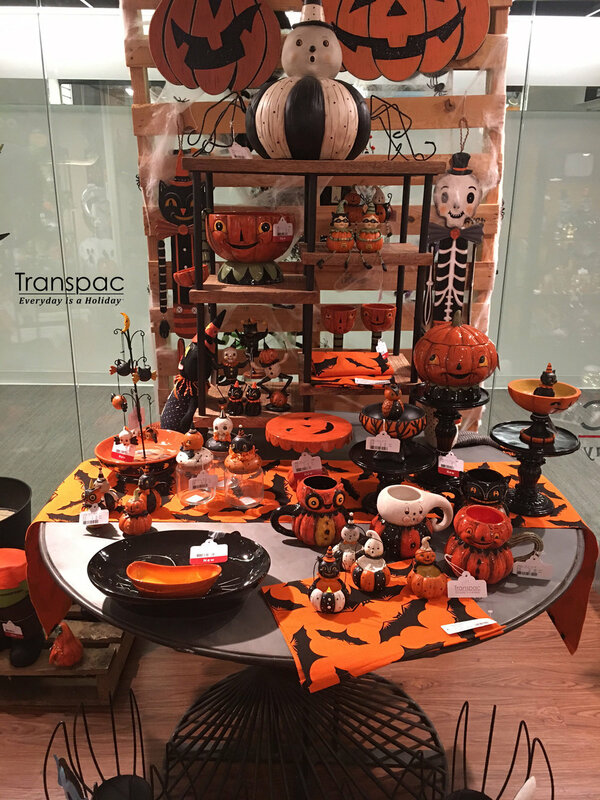 Vintage style Halloween can be yours at home with a few simple crafting supplies! Abby shares a few tricks to help shape the hats and adorn the tops… She printed these at a smaller scale to add more variety to the group. 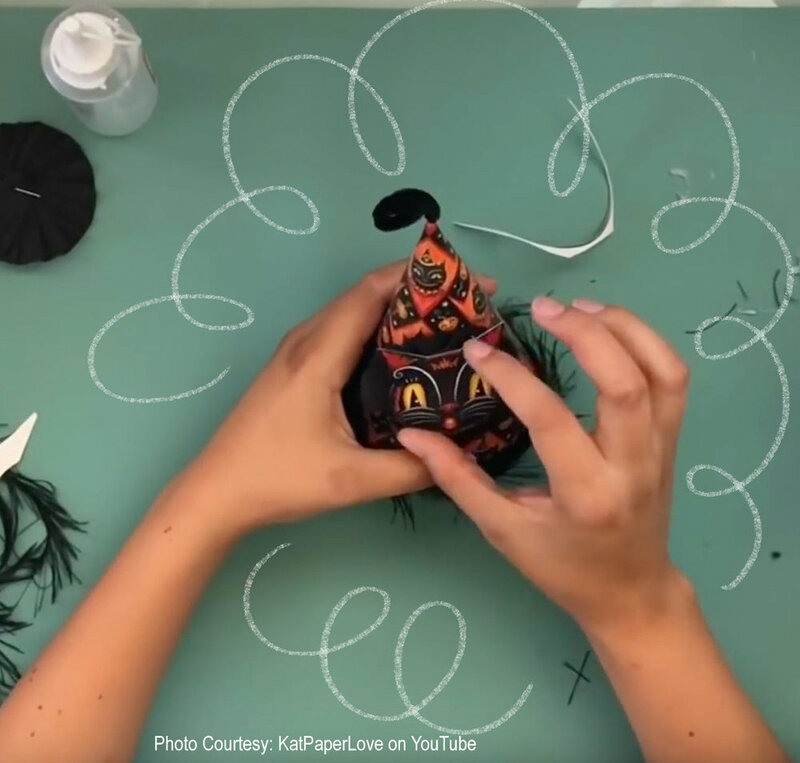 Just roll, glue and press… Abby takes the fear out of the project..
Make them large or small and festoon the objects in your home with a little Johanna Parker Design style! 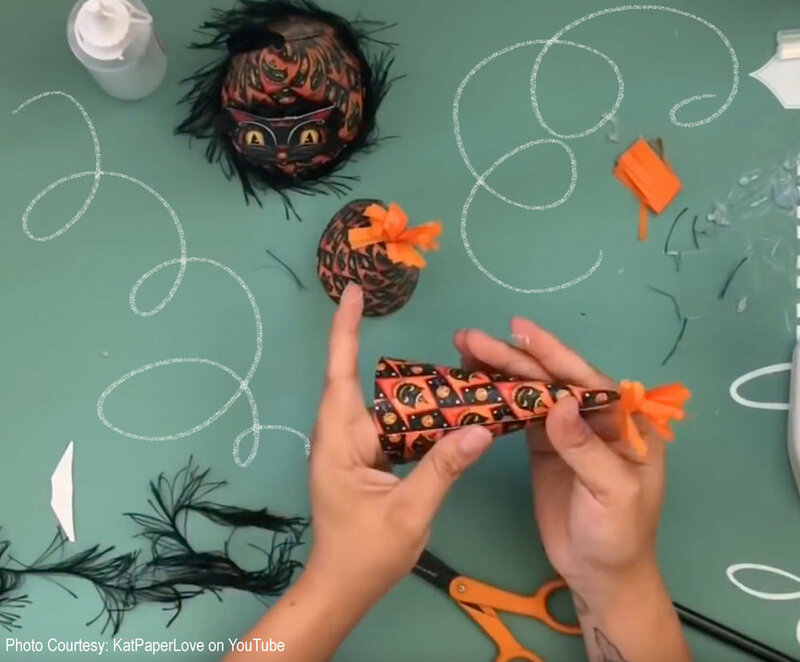 Many thanks once again to our creative guest feature, Abby @KatPaperLove for jumping in and sharing her talents and tips with us! 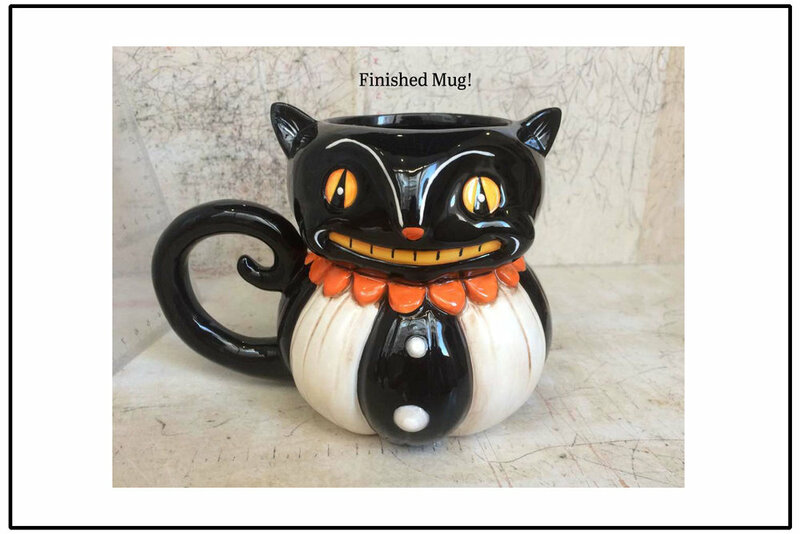 You can peek at her artful creations at @artista.kat as well. ENJOY! October 31st is here, and we gave Jack a different look this year! 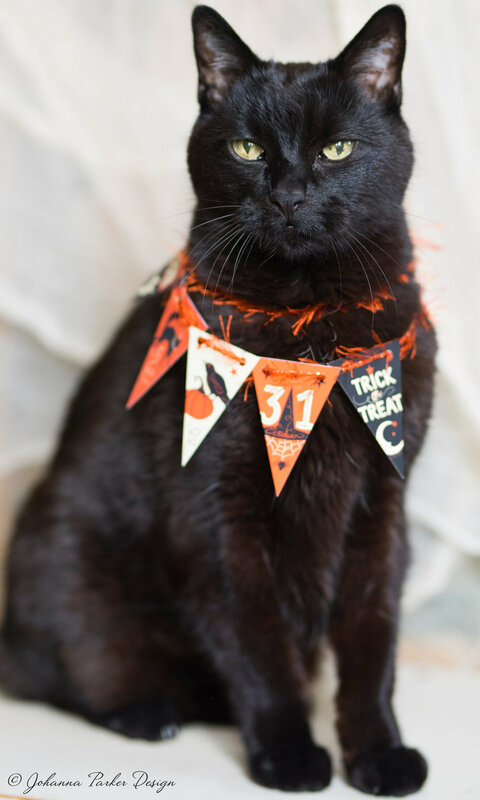 While I typically make a special paper hat for our furry friend to wear, he sported a mini-sized strand of my Vintage Halloween Pennants. Really, what a ham! He was fully engaged for this shoot. I placed him on an old picnic basket, draped his fluffy coat with Halloween flags, and he basically played along for the camera. JP snapped the shutter while I kept his attention at play. 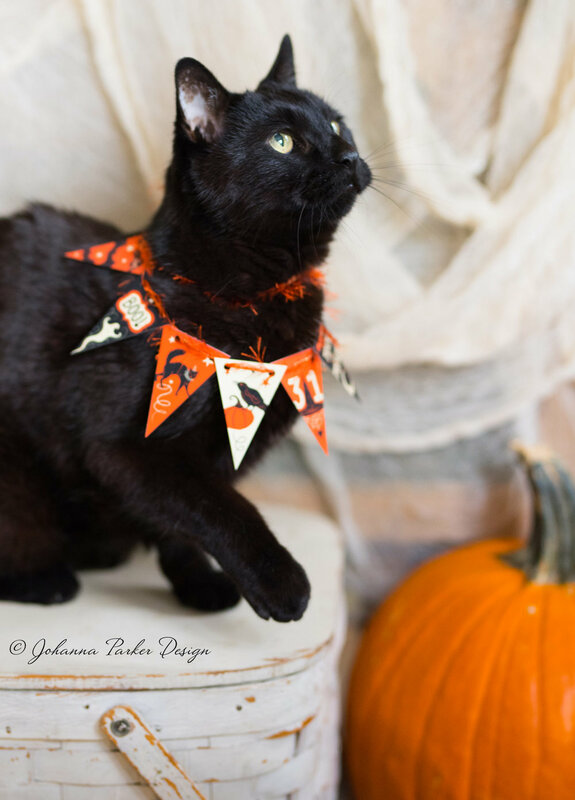 Enjoy a handful of photos from our Halloween photo shoot day! Here's one of the first lucky photos JP snapped ~ Jack sitting proud with puffed chest and eyes to the lens! Showing a little tongue and fang in this one! 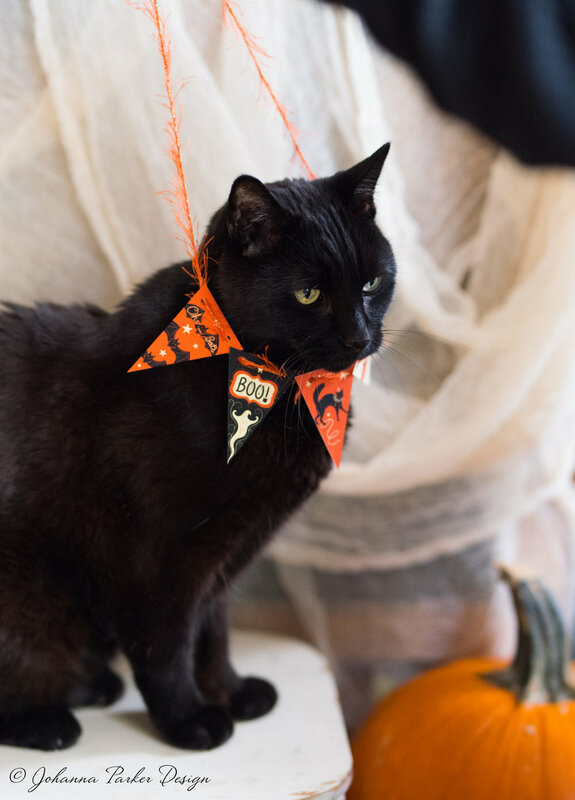 Wishing you a Purrrrfect Halloween! Get this look in our Store's DIY Printables page! The complete set comes with 6 unique designs that I have illustrated. Download and Print as many as you wish for personal use. Print 'em big or small and ENJOY them each fall! After a few months of sifting through photos, writing LOTS of descriptions and learning the capabilities and quirks of the web templates on this new platform, we finally launched our new site on July 1st! It's been a long time coming, but what a joy it is to have a fresh face on the web :) We then took a month to really test it and make sure things were working smoothly. NOW, on July 31st, we are Celebrating our Grand Opening! A Newsletter will be going out tomorrow to announce the fun news as well as other upcoming events! And what's a Celebration without a GIVE*AWAY and PRIZES?!! That said, we are hosting a fun "Count" so to speak! To help acquaint you with our new site, we are inviting you to COUNT the pages for a chance to WIN one of 4 hand-picked Artist-Signed prizes from the "Count" Dracula and friends group, pictured below! For the details, visit our "Win It" page! We'll be accepting your tallies via EMAIL through August 11th, and the 4 WINNERS will be posted here on our BLOG! ENJOY your Visit and HAPPY COUNTING!